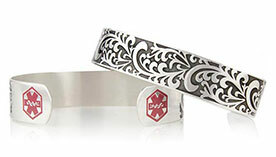 Choose the style you prefer, and we will engrave it with the wearer’s diagnosis and other pertinent information. Cognitive Disabilities, Developmental Disabilities, and Intellectual Disabilities are umbrella terms used to describe disabilities impacting the brain, typically involving one’s capacity to learn or function in a typical manner. Whether a person is born with an Intellectual Disability (previously called mental retardation or MR); is diagnosed with a genetic cognitive disability such as Down’s Syndrome; or has Autism, Alzheimer’s, or any other related condition, the one common thread is an impaired ability to understand and interact with the world. 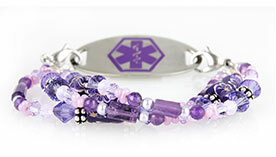 People with such special needs require special care, and one way to help provide that is through medical ID jewelry. If you or someone you love has a cognitive, intellectual, developmental, or other brain disorder, medical ID jewelry can make all the difference in an emergency. When a person with autism or Alzheimer’s wanders, for example, a medical ID necklace or bracelet can help by bearing contact information for caregivers or parents. 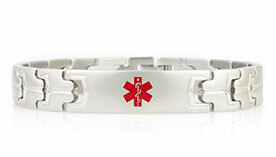 Additionally, in the event of an accident, personalized medical ID jewelry will alert EMTs and emergency room personnel to the baseline diagnosis of an Intellectual Disability, which may prevent the patient from undergoing unnecessary tests and screenings that might otherwise be performed when someone is not responsive to medical personnel in a typical manner. If you or someone you love has a cognitive, intellectual, acquired, or developmental brain disorder, wearing medical ID jewelry is imperative. 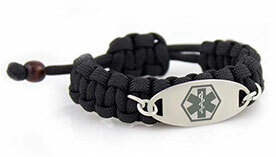 We recommend listing the wearer’s name, diagnosis(es), any medications, all allergies, and emergency contact numbers.